Welcome to Women March in Seneca Falls! Women March in Seneca Falls is an inclusive, non-partisan group dedicated to providing opportunities to publicly demonstrate the strength, power, and courage of women in America. It is committed to protecting and enhancing rights belonging to women through awareness and fund raising, meaningful collaborations, and community education in Seneca Falls, New York, US birthplace of women’s rights, and throughout New York state. 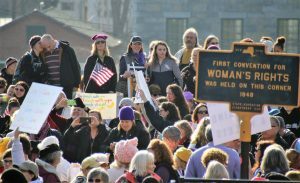 Through frequent “calls to action,” Women March in Seneca Falls continually reminds local, state, and national elected and appointed government officials that women’s rights activists are vigilantly carrying on the political activism of their foremothers.